I’m not generally one to read memoirs, but I was pulled in by the middle daughter aspect of the book. As a middle child, I was curious about Maisie’s experience and I hoped that I might be able to understand a little more about how my own thought process is. This wasn’t what I was expecting at all. The main problem was that I was wanting it to read like an autobiography, which it isn’t. Rather than start from the beginning of her life and arc to the end, it jumped around. 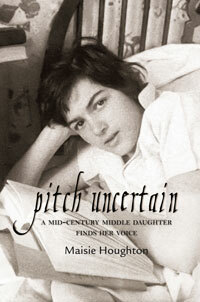 The book is actually a compilation of essays that have been assembled, each focusing on an aspect of Maisie’s life. This included the people in her life, which was very confusing. As a memoir, it is written in first person so it was difficult to distinguish if she was referring to herself as an older woman or if she was in the middle of the memory she was sharing. It felt like she spent more time talking about everyone else in her family than she did herself. She would tell an experience and then pose a question about what she could possibly have learned from said experience, and then move on. The question was never answered. There was also a great deal of inconsistency. One minute she would be talking about how “I savored being alone with these two nostalgic, middle-aged men,” one of the men being her father, but then two pages later she would say, about her father, “I wanted to be loyal to him even if I dreaded being with him.” Which is it? Do you love being with him or dread it? The very last chapter of the book I finally found a sense of closure when she finally explained what she had learned from all of these experiences in her life, which is mainly that she didn’t find her voice until she was an adult and could look back on these experiences with a new perspective. I was, however, very impressed with her ability to express what life was like in the 1940’s and 50’s. Her attention to detail was amazing. It made me want to go back and write down everything I can remember about spending evenings with my grandparents before I lose the memories. Maisie explains things that she experienced as a four year old when I can barely remember my first day of the second grade when I was seven. If you are fascinated with the way society ran in the 40’s and 50’s you should enjoy this book, but if you’re hoping for a great coming of age story, you may be disappointed. I wasn’t blown away by this book, but I will keep it on my bookshelf.